History, Photos of Tribal Facial Art Using Pigments, Woad, Henna and Annatto. Like body painting, face painting is less an art, than an ancient craft which dates from the era of Paleolithic art and culture. Used primarily to identify important individuals (like tribal chiefs, shamans, and witch doctors), to denote the different genders and social classes, and to reflect military rank, the painting of faces was a common cultural practice in most parts of the world: see, for instance, American Indian art. Indeed, it survives in tribal art to this day in Africa, Asia, South America, parts of Australia and in some Pacific Islands of Polynesia and Melanesia. Colour pigments used, include woad, charcoal, ochre, henna and annatto. More functional face painting encompasses the use of camouflage facial paint, sports paint used to reduce sun glare and highly specialist protective paint applied for medical reasons. Face painting has also become a widespread amusement for children. A modern form of Japanese art. Modern day cosmetic colourants used by Western women represent a clear link with primitive facial paints. 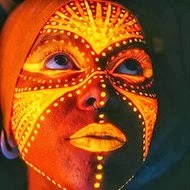 This type of cosmetic body art incorporates a huge range of dyes, lotions, applicators and techniques for adorning the lines of the eyes and lips, and for colouring the cheeks, mouth and other facial areas. It remains a complex decorative art, performed to highlight gender and beauty, and express personality. 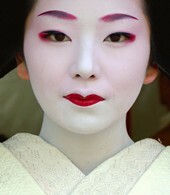 One high-point of this form of face painting was the Japanese Geisha culture, in which women's faces were decorated to an almost artistic standard. Face painting can achieve undeniable facial beauty. It may not be classified as a visual art, and may not be included in the history of art, but arguably both the traditional form - as practised by indigenous peoples - and its modern day cosmetics counterpart converts the mundane into something beautiful and visually stimulating. For nail painting, see: Nail Art. For more about the impact of tribal art on the West, see: Primitivism.  For details of oil, watercolour and acrylic artists, see: Homepage.